Professional gel coat repair is about paying attention to the little details that make a big difference. A small chip or scratch? No problem. We color match gel coat in house. When Championship Marine Repair works on your watercraft our team of professionals are bringing over 50 years’ experience to your repair and our goal is perfection. We know that missing even a small flaw on your boat can make or break the job. Championship Marine Repair in Southwest Missouri will make sure even the smallest imperfections are fully addressed before they evolve into a more costly repair. We provide free written quotes and handle insurance claims for all major insurance companies. 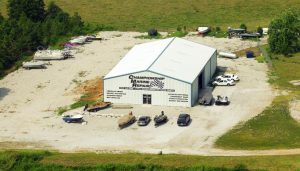 Located conveniently on Highway 160 half way between Nixa and Branson West, in Spokane, MO, you’ll be sure to see us on the way to or from Table Rock Lake. We are 1 mile south of Highway V and 1/4 mile north of the Gateway Café. We are less than 30 minutes from Springfield, Branson, Shell Knob and Kimberling City in Southwest Missouri. Call us today and see how our decades of workmanship will get you safely back on the water sooner.